I first started with the tradition of holiday baking when I was around 20 years old. My daughter was only a few months old and we were just starting out our family life together. I figured why not start a new holiday tradition. I loved spending time in the kitchen and trying new recipes. I gathered up all my cookbooks and selected recipes to try. I may have went a little overboard because I made sooooo much food. We didn’t have a deep freezer so I ended up having to give a bunch away to family and friends. Fast forward a few years and I’m still baking around the holidays. However, I’m more selective with the recipes I’m making. I still don’t have a deep freezer so I don’t want to make too much that I can’t store it all. I do give some to friends and family though, but not as much as that first year. This Christmas, I made new bar recipe that everyone loved. 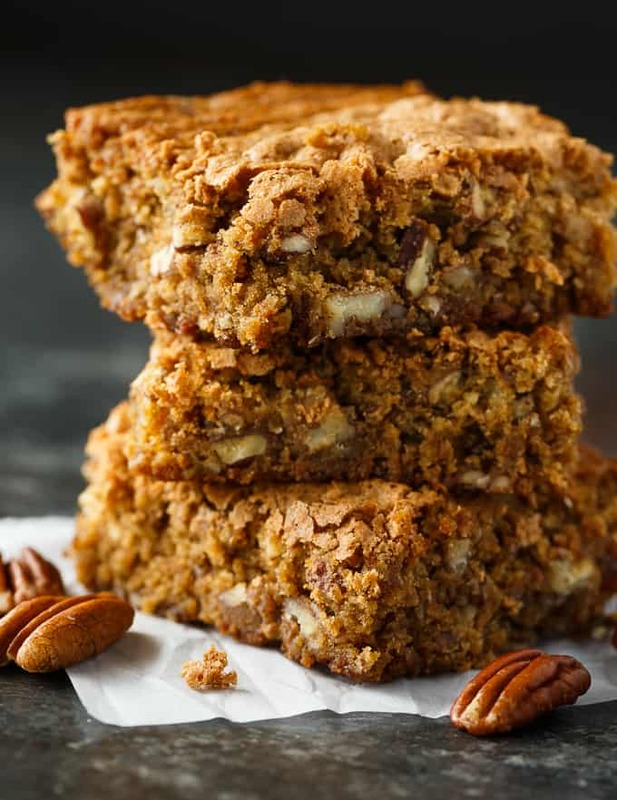 Pecan Cake Bars are chewy, moist and incredibly delicious. The addition of pecans adds a lovely crunch to each bite. They are also easy to make. I don’t like complicated recipes. This is a very basic recipe that you can whip up quickly. Serve them with some coffee or tea for your holiday guests. My favourite part of the bar is the buttery bottom. 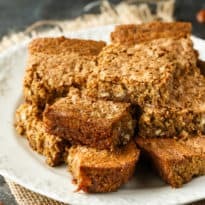 The cake bars bake in a pool of melted butter that adds an extra element of richness. Trust me, it’s hard to stop at eating just one bar. For more recipes, make sure to check out my Holiday Entertaining Guide. I’ll be updating it frequently throughout the holiday season to give you ideas and inspiration for your holiday menu. Check out these Pecan Butter Tart Shortbread Bars and Gingerbread Cheesecake Bars. I’d love to hear what you are baking this holiday season. Do you keep the goodies for yourself or do you give some away to family and friends? Pecan Cake Bars are chewy, moist and incredibly delicious. The addition of pecans adds a lovely crunch to each bite. Try this recipe for holiday baking! Preheat oven to 350F. Pour butter into a 9×13 baking pan. Set aside. In a large bowl, stir together brown sugar, flour, eggs, vanilla, baking soda and salt. Stir in pecans. Bake for 30 minutes. Cool before cutting into squares. Now my month is watering and I really must try it out! These sound absolutely delicious and perfect for eating in the morning when you’re in a rush. I love a good crunch in a bar. These sound delicious! 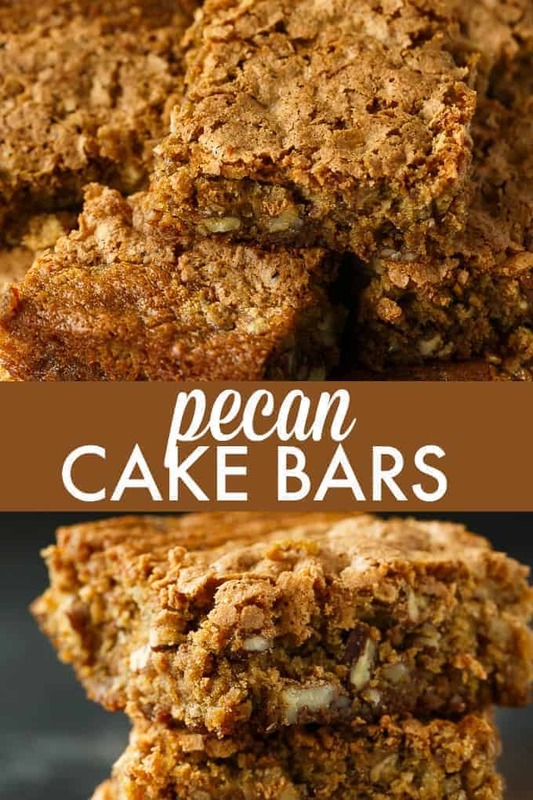 These pecan bars look super yummy, thanks very much for sharing the recipe. We will love these delicious bars! Hope you are having a wonderful week and thanks so much for sharing with Full Plate Thursday.